A slew of mudslides and fallen trees on Sunday blocked portions of Highway 17 in the Santa Cruz Mountains, creating a traffic headache for drivers. 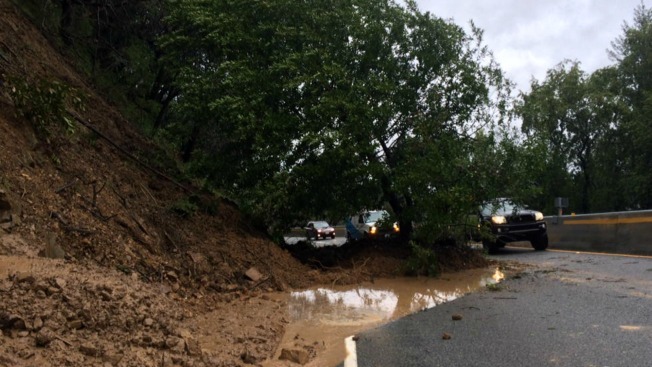 The first major mudslide, which happened near a recently constructed rock wall designed to prevent such an episode from happening, was reported around 7:30 a.m., and it blocked both lanes of northbound traffic near Vine Hill Road for roughly two hours. The left lane of northbound Highway 17 reopened at roughly 9:20 a.m., according to the California Highway Patrol. The right lane reopened Sunday afternoon. To make matters worse, a semi-truck driver slammed into the mudslide and had to be towed away from the scene. "When I was driving north, I saw the grass and mud ahead of me and I stepped hard on the brakes, but still went into it," truck driver Roy Trevino said. Trevino was not injured, according to the CHP. Two other minor hazards along Highway 17 included a downed tree in the southbound direction near Redwood Estates Road. Another mudslide also blocked the right lane of southbound traffic near Summit Road. Sunday's hazards were not the first this winter season to plague the stretch of roadway linking Santa Cruz and the South Bay. Locations throughout the Santa Cruz Mountains have been bombarded by heavy rains, which have subsequently triggered a host of mudslides and erosion. On a positive note, runoff from the mountain range has also filled nearby reservoirs to the brim. The Lexington Reservoir, which was over capacity as of Sunday afternoon, sent water gushing into nearby creeks. Joe MacGuire of San Jose was pleasantly surprised to see the Los Gatos Creek roaring with water. "This is as full as I've ever seen it," he said.